Considered one among the eight principal classical dance forms of the country that traces its origin in the 15th and the 16th century, Sattriya was at its artistic best in a cultural programme entitled ‘Nrityaprabha’ which showcased the performance of one of the State’s leading Sattriya exponents, Kashmiri Hazarika Kakati. 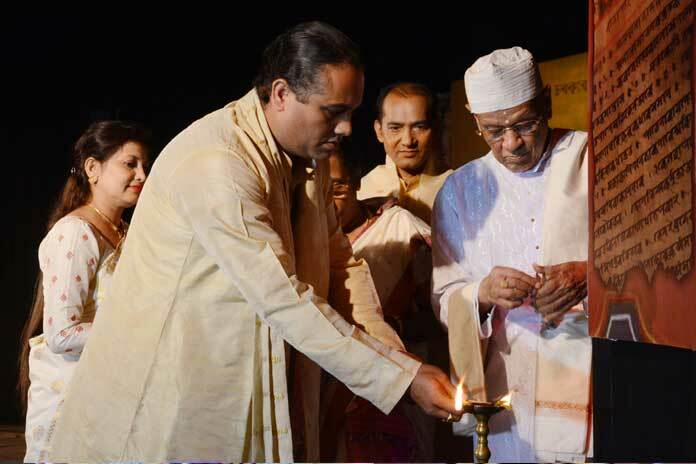 Presented as ‘Krishnashe Param Dewah’, the evening of pure, unadulterated classical Sattriya, held under the aegis of the State’s Directorate of Cultural Affairs, began with the lighting of the traditional lamp by the former president of Asom Sattra Mahasabha and the Satradhikar of Jokai Sattra, Bhadrakrishna Devagoswami, and the Satradhikar of Uttar Kamalabari Sattra, Janardan Devagoswami. During his speech, Janardan Devagoswami said – “Instead of just performing on stage, the new generation artistes should stress on promoting and propagating our Sattriya culture in every nook and corner of the State.” He has also called upon the artistes to ensure that the dance remains free from the influence of other styles. Bhadrakrishna Devagoswami urged upon the artistes and dance exponents to perform Sattriya dance without diluting the purity of its form. “Its paramount that this much treasured classical dance form performed in the sattras retains its originality”, he said. He also felt that programmes such as this would go a long way in reviving the traditional Sattriya culture and heritage among the youth. Soon the Rabindra Bhawan auditorium reverberated with the sounds of dhol and khol, with a riveting Gayan-Bayan performance by the ShriShri Uttar Kamalabari Sattra Sankardev Kristi Sangha, which boasts of some of the richest treasure trove of dances, transporting a packed audience to an incredible journey of spirituality. After the opening act, Kashmiri Hazarika Kakati, the evening’s centre of attraction, performs a soulful Borgeet – “Mai Hera Gakul Chand Aawe..” written by Madhavdev, showcasing her superb command over vocal music as well. Kashmiri then felicitated her renowned Gurus – Bhaben Bora Barbayan, Ramkrishna Talukdar and Dimbeshwar Bhuyan on stage. It was followed by a Sutradhari dance performance by Kashmiri Hazarika Kakati in all her grandeur and elegance. The character of Sutradhar plays a prominent role in the ‘Ankia Naats’ as it was used by Mahapurush Srimanta Sankardev as a story telling tool to preach Vaisnavism to the common people. The ease and grace with which Kashmiri performed the item held the audience spellbound till the very end. The next abhinaya piece by Kashmiri Hazarika Kakati was the ‘Krishna Katha Varnanam’ based on Naandi Slok, depicting Lord Krishna’s various embodiments. The artiste followed it up with a bhatima ‘Jaya Jaya Jadukul’ adapted from Sankardev’s Ankia Naat – ‘Kalia Daman’, depicting the supernatural powers with which Lord Krishna killed Kangsha. Referred to as the Gopi Krishna of Sattriya dance, the much feted Sattriya exponent Ramkrishna Talukdar’s profound creative ability and aesthetics is very much evident in his choreography to the items, which unravelled itself effortlessly in the performances of Kashmiri Hazarika Kakati. She displayed such grace and energy in her executions, every bit nuanced, in complete harmony with the music. Talukdar has made improvisations wherever needed but it goes without saying that the purity of the form has been kept intact. Srimanta Sankardev propagated a form of Vaishnavite faith known as Eka-Sarana-Hari-Nama-Dharma, or Mahapurusia dharma, devoted to a single God, Krishna, and stressed upon absolute devotion to him. The artiste comes up with renewed vigour and energy, while presenting the piece ‘Krishna Vandana’, which was performed as an obeisance to Lord Krishna. The audiences were delighted by artiste’s immaculate performance in the item called ‘Gopi Naach’, which is included in Lashya Nritya, that reflects the feminine style of Sattriya dance. Kashmiri’s last item, a delicate balance of drama and storytelling to the Borgeet composition by Madhavdev – ‘Ab Sakhi Madan Gopal..’, once again demonstrates her adroit movements, precise gestures and abhinaya. Finally, it was the turn of young students from Nartan Kala Niketan, a leading institution of Sattriya and Kathak dance, to showcase their skills in the item ‘Abhimanyu Bodh’. This really captivating piece was designed and directed by Ramkrishna Talukdar and Rumi Talukdar. Beautifully hosted by popular artiste Kapil Bora, ‘Nrityaprabha’ was a fabulous treat for the audiences, who gathered in huge numbers to watch the versatile Kashmiri Hazarika Kakati, who has brought laurels to Assam with a series of performances in cultural functions held in various parts of the country and abroad, including the Rongali Bihu Festival held in Quwait in 2015 where she performed with guru Ramkrishna Talukdar, followed by a solo Sattriya recital – ‘Nritya Bharati – 2015’ in California, in the city of Los Angeles, USA, where she performed with renowned classical dance exponent Sobha Dhananjay in the item ‘Bande Mataram’. Kashmiri was conferred with the Satyabhama Yuva Dance Artiste Award while participating in the Bharatiya Yuva Shastriya Samaroh held in Visakhapatnam in 2015. 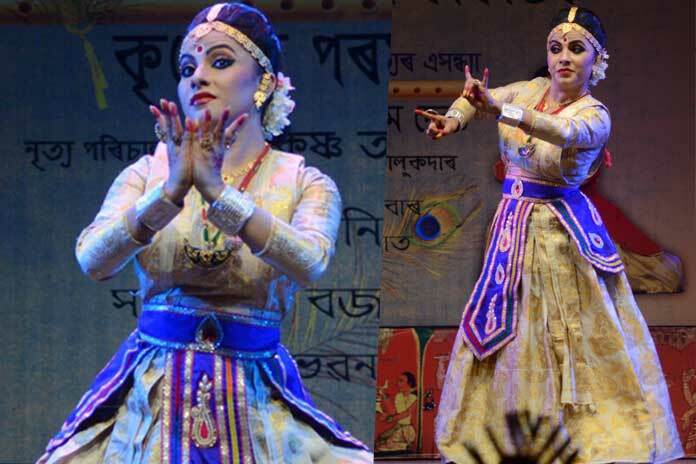 Apart from Sattriya, what caught the eye was the resplendent costumes and jewellery, which were designed by Rani Dutta Barua and Lakhimi Barua Bhuyan respectively. The makeup was done by Kishore Kalita, while the lighting was provided by Kaushik Borbora. The graphics designing was done by Uma Sonowal and Ratul Das. The overall designing and concept was looked after by Rebati Mohan Kakati. The programme was also graced by the likes of Dr Hitesh Deka, vice-chancellor, Krishnakanta Handique Open University, Raju Das, Programme Officer, Sattriya Kendra, Pritam Saikia, Commissioner Secretary, Cultural Department, Thaneshwar Malakar, Secretary, Primary Education, Bibekananda Choudhury, Director, Cultural Affairs, Ruparani Das Bora, Rumi Talukdar, Baby Bhuyan among others.